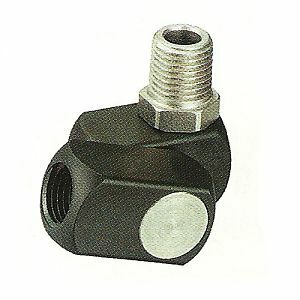 The Dynaswivel® is a "universal-joint" that connects portable air tools to an air line. It improves tol maneuverability, minimizes operator fatigue and extends hose life. Patented tool; works great on air tools and paint guns. Non-Marring composite construction. Swivels 360° at two Pivot Points allowing the air hose to drop directly to the floor while providing superb tool handling. • Air Flow Range: up to 33.